Bring home a new Voltas Adjustable Inverter AC or All Star Inverter AC with a Lifetime Warranty on compressor. Bring home a Voltas AC with a 5 year comprehensive product warranty, it covers all the functional parts of the product including gas charging and labor. 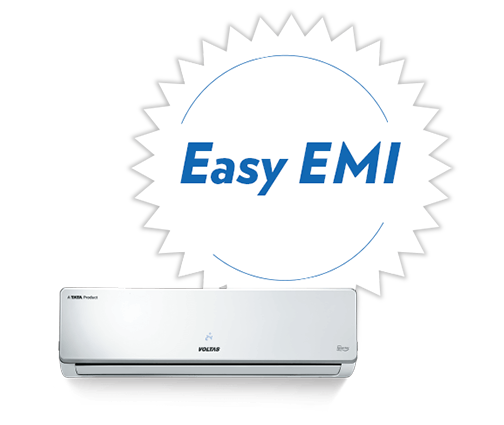 Get your AC at Easy EMIs. 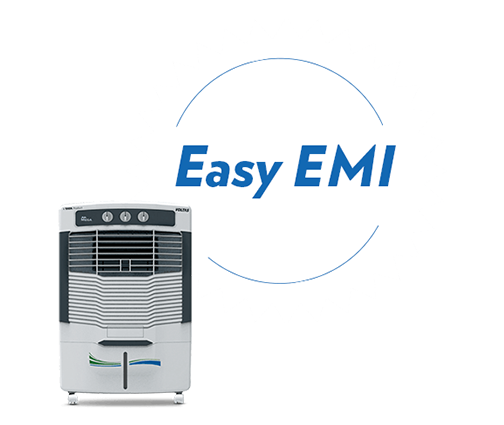 Pay in easy instalments..
Get your Air Cooler at Easy EMIs. Pay in easy instalments. 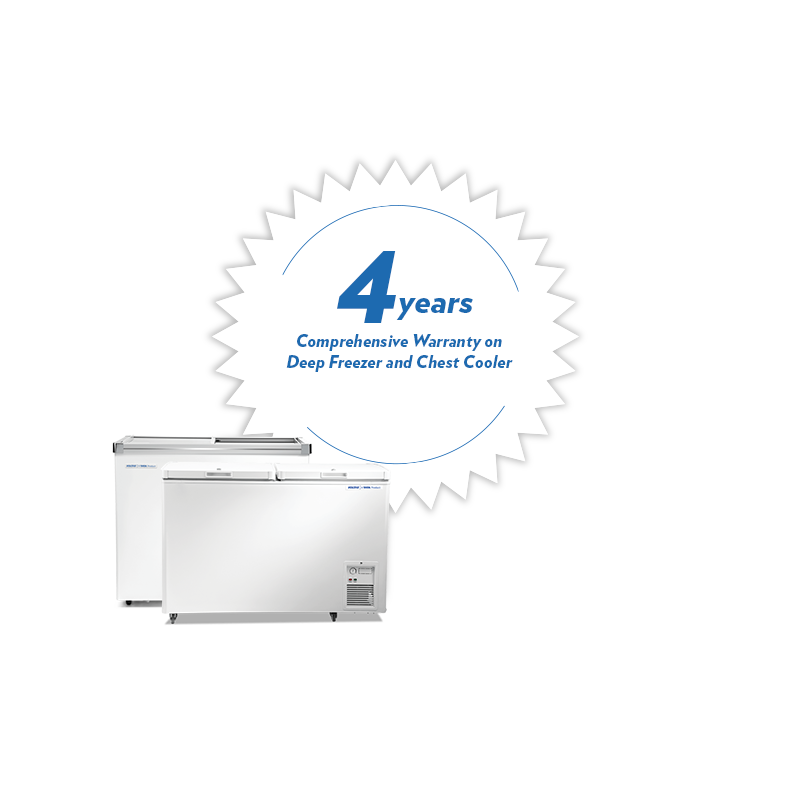 Get a new Voltas Deep Freezer and Chest Cooler with an extended compressor warranty (1+3 years). 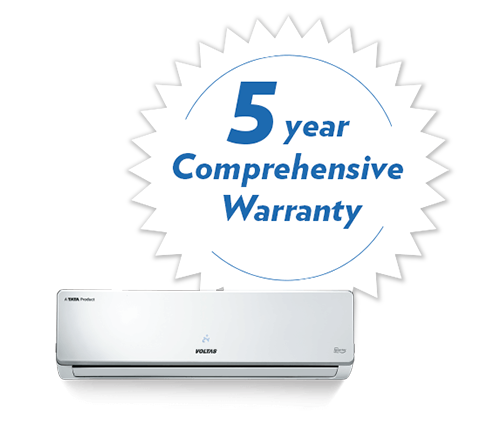 5 year comprehensive warranty is applicable on purchase of Voltas Adjustable Inverter AC, Voltas All Star Inverter ACs, All Weather Split ACs, All Weather Window ACs only and is applicable till 30 April, 2019 for Individual/Retail customers only. 5 year comprehensive warranty (1 + 4 year extended) including all functional parts, Gas charging & labour (plastic, sheet metal parts not covered). Extended warranty applicable when all of the below conditions are met. 1) Customer registers with Voltas for the extended warranty within a week of purchase. 2) Unit is installed by Voltas Authorized Service Partner. 3) Preventive Maintenance from 2nd year till 5th year (which will be on chargeable basis) is done by Voltas Authorized service partner. For this special extended warranty the customer need to register and send a SMS ‘WTA’ to 9289525321 within 7 days of purchase. Call centre representative will call back to customer to take all required details and update in system, (Details required- a) Customer Name, Address, Mobile Number, E-mail ID; b) Dealer name, Invoice number, Invoice date; c) Model name & Serial No.). Offer is not applicable on Cassette, Floor Standing and Mega Split. Any institutional sale is not covered. 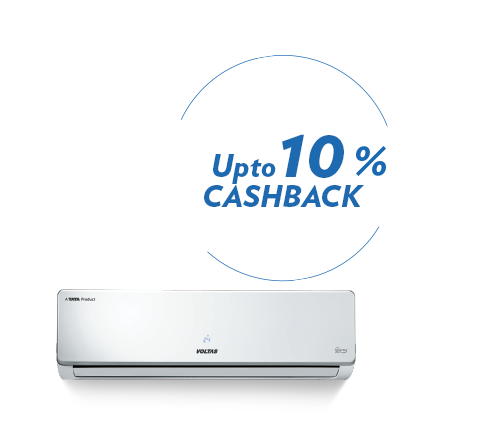 All Offers valid till stocks last and are subject to change without prior notice by Voltas at its sole discretion. Offers valid on select models only, sold through Voltas authorized Channel Partners. For standard warranty terms refer to the user manual. For product registration SMS to 9289525321 or call 1860 599 4555. #Lifetime Warranty on inverter compressor is applicable on purchase of Voltas All Star Inverter ACs only, made till 30th April 2019 for Individual/Retail customers only. As per E-Waste Management rules - 2016 Guidelines, the average life of an AC (excluding Centralized AC) is 10 years (which defines the lifetime of the inverter compressor in the offer). 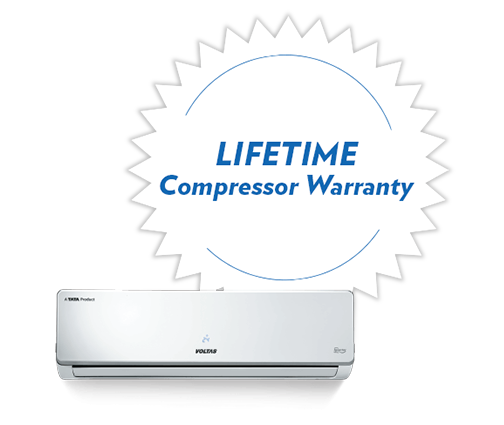 Over and above the 5 Year comprehensive warranty, the additional 5 Year Warranty is only on Inverter compressor and does not include any other part, Gas charging & labour costs. It is applicable on purchase of any Voltas Split or Window AC. The offer is through select NBFCs. Finance at the sole discretion of the finance company. This finance offer is applicable till 30th April, 2019. 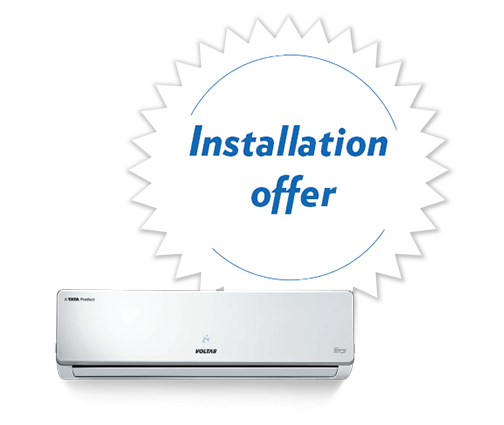 Installation offer at special price of ₹499/- is available only on Voltas Split ACs, purchased through authorized channel partner and installed through authorized service franchisees / SSDs. It does not include any carpentry and masonry charges. The offer is only valid till 15 April, 2018. No Cost EMI is a separate offer pertaining to financing by NBFCs. This finance offer is a limited period offer. Finance offer is only available on purchase of Voltas Fresh Air Coolers through an authorized retail outlet only. Finance offer is not applicable on any institutional sales. For further detailed terms and conditions please contact the Dealer. 4 Year (1 + 3 year extended) Warranty on Compressors for all Deep Freezers sold through channel partners purchased by end consumer till 30th April'19. Labor charges & Preventive Maintenance after one year including Gas Charging (if any) to be borne by the customer. Offer is not applicable on Chest Coolers, Visi Coolers and Chocolate Coolers. To avail this special warranty, end consumer has to simply send a SMS ‘WTA’ to 92895 25321 within 7 days of purchase. Our call center will call back to customer to take all required details. Once registration is done, a confirmation mail will be sent to customer email id. Connecting the wiring and commission the unit. Installation of stabilizer provided by customer. The cash back offer is on market operative price. The cash back offer through Credit and Debit card is applicable at select outlets on transactions done on Pine Labs machines under ‘Voltas Brand EMI’ option only. Cash Back to be posted 90 days from offer end date. Cash Back amount will get printed for eligible card holders on the charge slip. Customer to immediately check with merchant if cash back is not mentioned on the charge slip. Customer will not be eligible for cash back if the same is not mentioned on charge slip. Customers are requested to retain charge slip for 180 days post program end. This is a limited period valid till 30th April 2019. Installation offer at special price of ₹499/- is available only on Voltas All Star Inverter ACs, purchased through authorized channel partner and installed through authorized service franchisees / SSDs. The offer is only valid till 30th April, 2019. Free Installation offer is available only on Voltas Fixed Speed Split ACs, purchased through authorized channel partner and installed through authorized service franchisees / SSDs. True Zero Finance offer entail zero down payment, zero processing fees and zero interest fee. It is applicable on purchase of Voltas All Star Inverter ACs and Fixed speed Voltas Split ACs.